Pets is a fun theme you can do anytime during the year. I always try to pick themes I know my students will be interested in. A great theme is one where you can easily create hands on, engaging activities to teach your little learners various skills and concepts. In this post, I’m sharing my go-to math, literacy, sensory, fine motor, blocks, STEM, art and dramatic play pet themed activities. 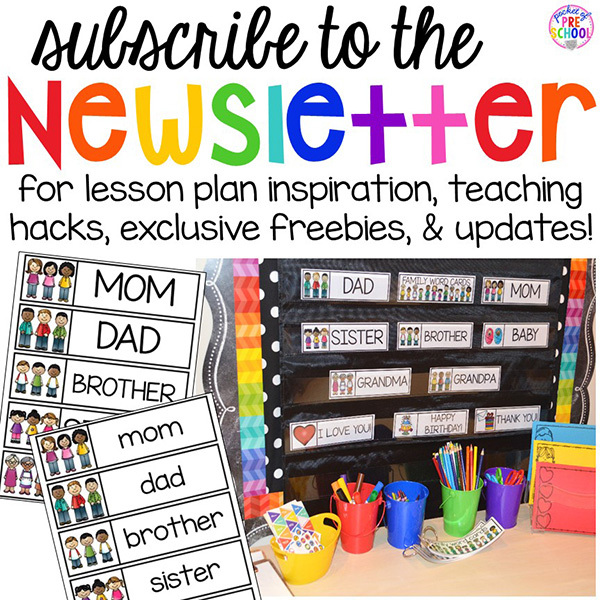 Grab your lesson plan book and let’s get started. Don’t forget to grab the FREE goldfish graphs in the post! Dog bones! Go to the store and buy a few boxes of dog bones to use as math manipulatives. Students can weigh the dog bones and pet counters on a balance scale. Which weights the most? How many dog bones are equal to one pet counter? It’s a fun way to get students thinking about more, less and equal to. It also gets kids using math comparison language. Try measuring with dog bones and sorting dog bones too! Grab some number cards, birdseed, bird counters, and writing trays to create a bird themed math tray. Students pick a number, count out the corresponding number of birds and write the numeral in the tray. Feed the Dog counting game is easy to set up and students LOVE it! Students roll the dice, count out the corresponding number of dog bones and put the bones in the dog bowl. Too easy for some of your students? Just put out two dice. Students roll the dice, add and count out the total number of dog bones. Need another math game? I’ve got you covered with Pet Add it, Build It and Pet Count it, Build It. Grab some cubes so students can count, add and build. Students roll two dice, add, count out the total and place the cube stack on their board. Now students can see and compare numbers! For example, nine is taller/more than three. Make a Pet Mom and Baby Number Line! Students are identifying numbers and counting on. FREEBIE alert! Just click HERE or the photo to grab your goldfish graphs! Make graphing come to life using yummy goldfish crackers! Students can make a number graph or a color graph. Talk about the results of the color graph. Which has the most/least/equal? Have students compare their graph with a friend’s graph. Did they get the same results? How are the graphs different/same? Play Frog I Spy a Shape to practice identifying shapes and drawing shapes. Notice and ask questions about the shapes. How many points/corners does the ____ have? There are so many great non-fiction books about pets! I filled my bookshelf with non-fiction pet books for students to “read”. Pet Letter Puzzles make identifying letters more fun. Pet rhyme puzzles are a ton of fun too! Identifying beginning sounds is hard. Make it interactive using Pet Beginning Sound Boards and magnet letters. Grab some cookie trays, magnet letters and pet word cards for a pet themed word work center activity. The cookie tray is from the Dollar Tree! Make a pet themed writing center. 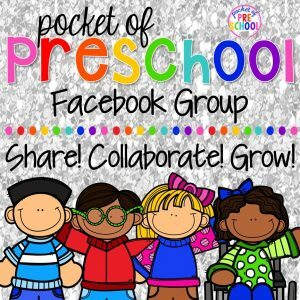 Add some pet stickers, pet word vocabulary word cards in my black pocket chart, pet writing paper, envelopes and fun writing tools (markers, colored pencils, pens). Change up the writing center to make it inviting. Make it a place your students want to go! Pet research preschool style. Research is not too hard for little learners as long as you allow students to work at their own level. Put out some non-fiction books and “read” the photos. Notice and think out loud about what the pet is doing and what is in the cage. Students will join in and continue the discussion! The photo above is of pre-k student. My three-year-old students had scribble pictures and mock writing on their pages. What matters is students develop a love of learning, not a perfect page! Make a hamster sensory bin using hole punches, paper towel tubes, hamster counters, tweezers and plastic containers. It does make a bit of a mess but the play is totally worth it! Students are filling, dumping, sorting and hiding the items in the sensory table. Little do students know that as they play they are learning about capacity and developing fine motor skills! Where did I get all the hole punches? I put a box in the copy room at my school with a sign for teachers to empty the hole punches from the copy machine in the box. If you work in a small center or in a home preschool, go to a copy store and ask them for their hole punches! 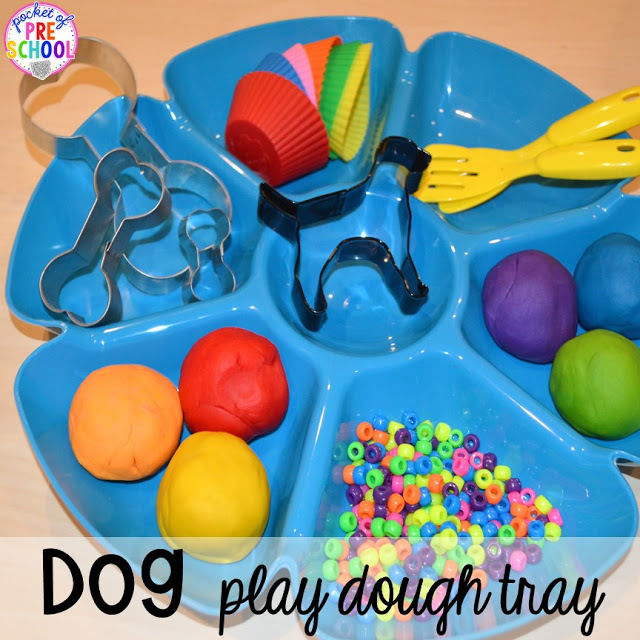 Make a dog themed play dough tray. Find some dog bone cookie cutters, rubber cupcake liners, spatulas and pony beads to make the tray. It’s a doggie bakery tray! Make a open-ended art activity about pet birds…painting with feathers! Students can make different types of lines and textures with the feathers. It’s also very relaxing. Make fish aquariums with oil pastels and watercolor paints. Students draw their fish aquarium with the oil pastels first then paint the water with watercolor paints. Hang the pictures up to create a beautiful bulletin board. Add new props and books for the pet theme to the blocks center. Pet animals, rocks, leaves, tree rings, foam board and pet books will inspire your students to make pet homes! Add STEM challenges by posting these FREE pet posters in the blocks center too! Add a few pet home challenges each week of the pet theme to keep students challenged in the blocks center. Grab these Pet STEM Posters HERE for free from my TPT store. Get a PET FISH for the classroom during the pet theme! Research what a fish needs and have students help you make a shopping list of what they will need for their pet fish. Observe the fish throughout the theme to teach students about fish and what animals need. You can grab my All About Fish science unit in my TPT store HERE. Take the pet theme to the dramatic play center and change it into a Pet Store or a Vet Pet Hospital! Read all about my Pet Store by clicking on the picture above or the Vet Pet Hospital by clicking on the picture below. Want ALL my pet printables? Save time and grab my Pet Math and Literacy Centers HERE. Love this post? Pin the image above! Need more pet themed inspiration? Follow my pet themed Pinterest board.